This outfit did not start out this way. That infact is a dress. I had worn the top under the dress and without the belt and it did not flatter my inverted triangle shape at all. I revamped the outfit mid day to balance my shape better and viola! The dress by itself does not flatter my body type but fits the model perfectly. I ordered it online (I do most of my shopping online so it's always hit or miss on fit for me) and I had altered it by taking in the waist and bottom half and was ready to give it away when it still wasn't working for me. Now, I think it's a keeper as long as I find ways to make it work. There may be outfits in your closet that you never wear because they don't work by themselves Adding a belt, a cardigan or wearing it a different way could give new life to the outfit. Check out my good blogger friend Audrey's post on making outfits work (Hope I can call you that Audrey). 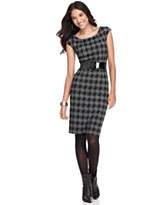 I love this dress, the houndstooth dress looks great and layered under a sweater? Love the look! Forever 21 is a great place to shop no matter the age! Honestly they have staples like 100% cotton shirts and the jewelry is always a great compliment to any outfit! You are not too old in the slightest bit. Thank you for stopping by, I'm following your blog and look forward to your next post!